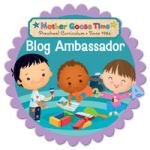 Each month, Mother Goose Time sends special teaching tools, everyday math manipulatives for preschoolers, that can be used multiple times throughout the month to teach counting, sorting, shapes, spatial awareness and problem-solving. Manipulatives from Mother Goose Time include pattern blocks, lacing cards, beads, links, math story cards and number cards. Manipulatives make learning about math hands on, engaging and fun. 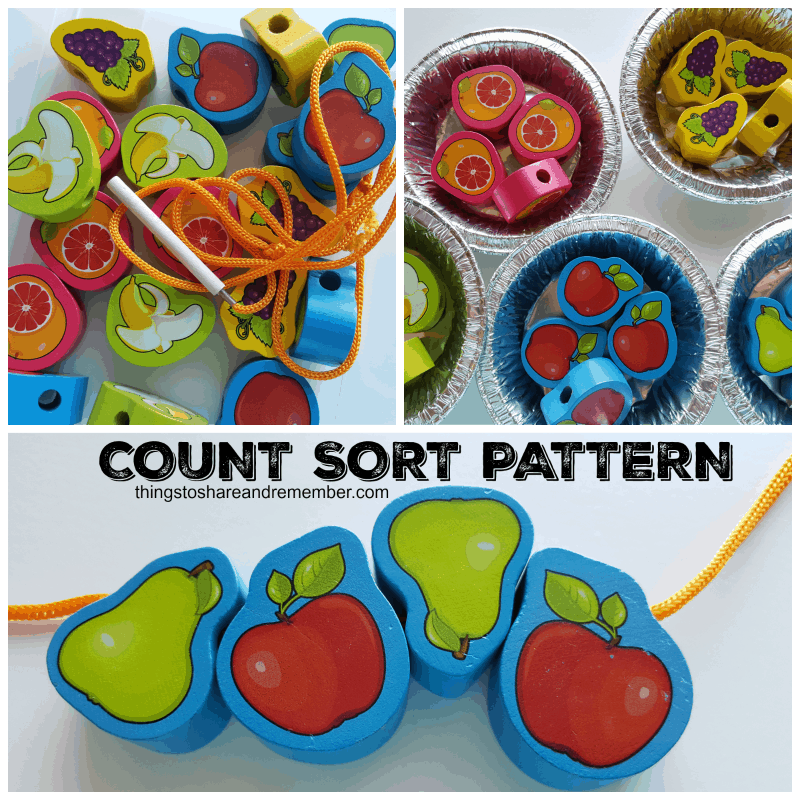 Using small objects to count or sort in play makes math real. The manipulatives kit below is from the August Folktales and Fables theme. 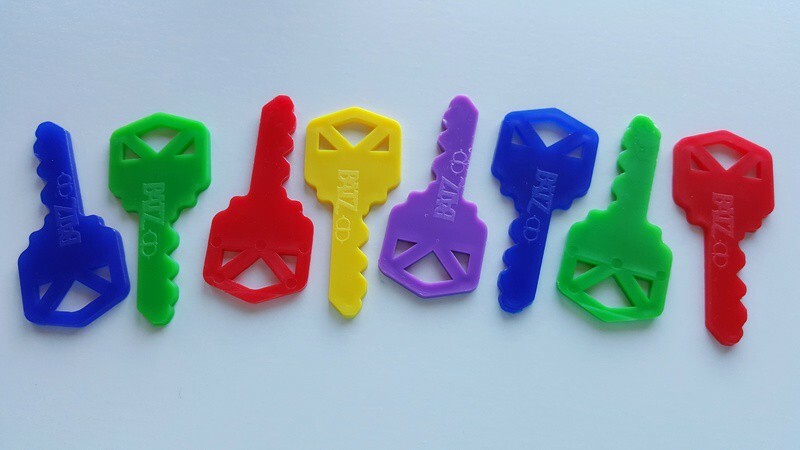 Manipulatives can be purchased or found and collected. 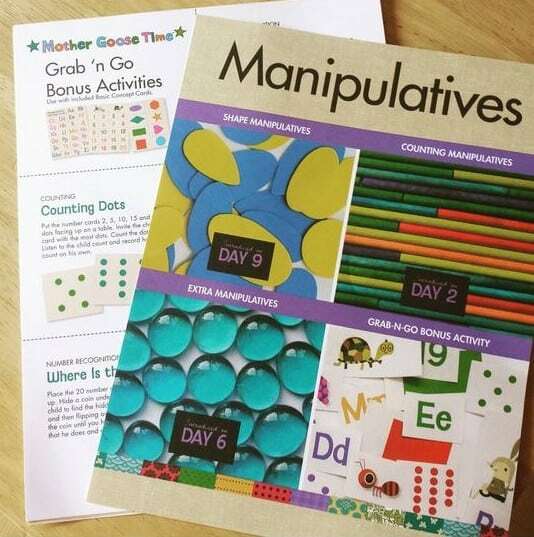 When shopping, especially at dollar stores or arts and craft stores, keep an eye out for items that could be used as manipulatives. 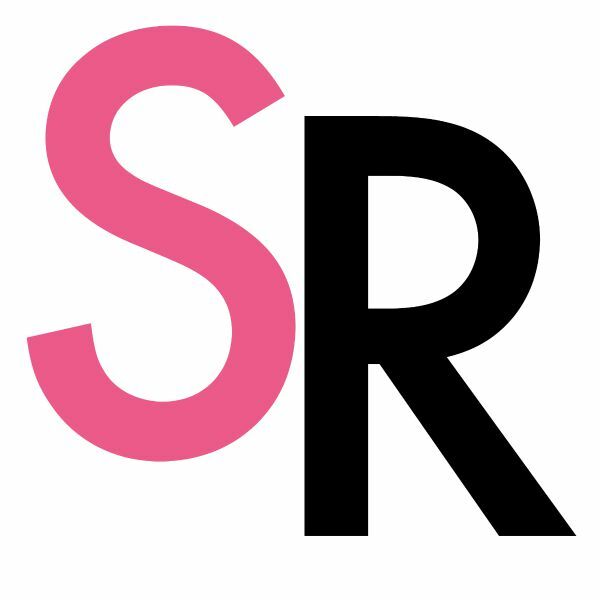 There are also many free or low-cost items that work just as well. Just make sure they are clean and safe. Children should be supervised with small objects. Rote Counting: Rote counting is based on memorization of number order. Assigning a number to an object is the developmental milestone called one-to-one correspondence, and makes counting meaningful. Create and use a number line. 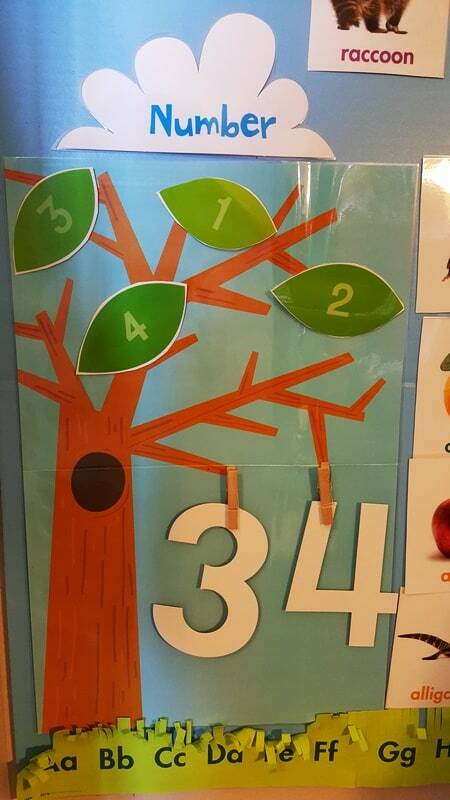 This one allows the children to match the numbers. 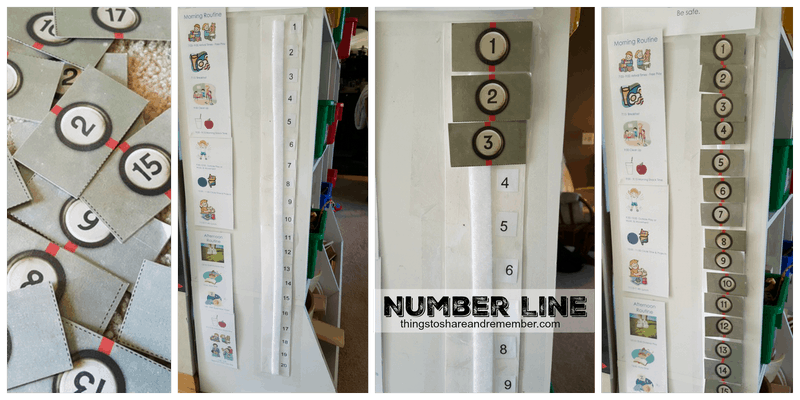 This number line was included in the June kit, Alphabet House. Sequencing and patterning: a repeated sequence is a pattern. 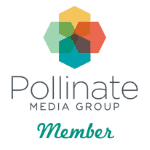 Patterns are things- numbers, shapes or images that repeat in a logical way. 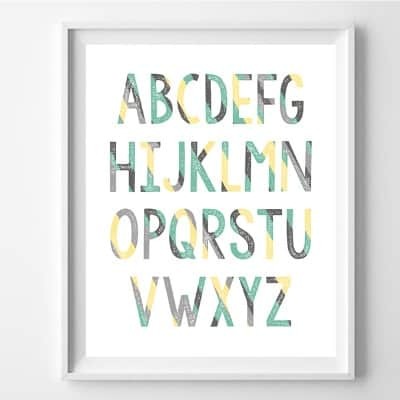 Patterns help children make predictions, to understand what comes next, to make logical connections and to use reasoning skills. 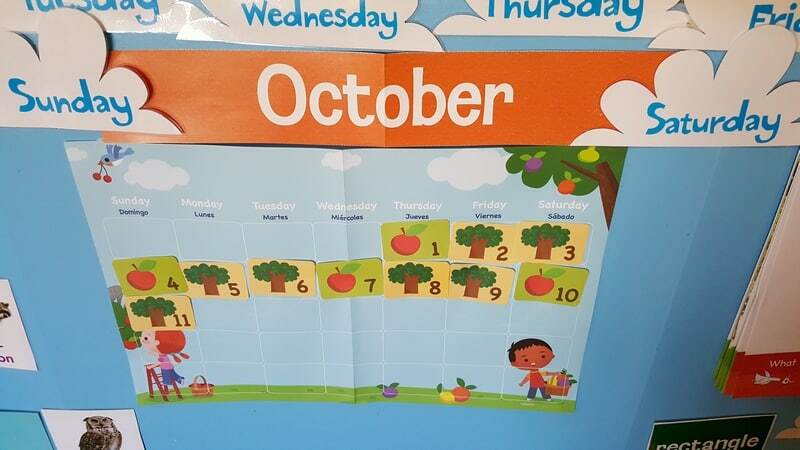 We use the Mother Goose Time calendar to talk about the calendar, days of the week, patterns and count. My group easily learns to count to 30 since we count the days on the calendar every day. In the photos below, we used the Mother Goose Time Math Story Cards and rabbit counters to make mathematical ideas “real” using objects. 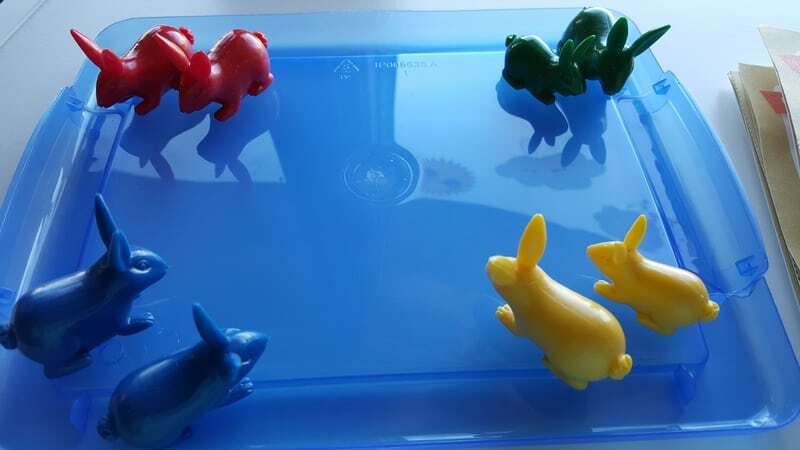 The rabbits are small, medium and large and also four different colors so they are a very flexible math manipulative. 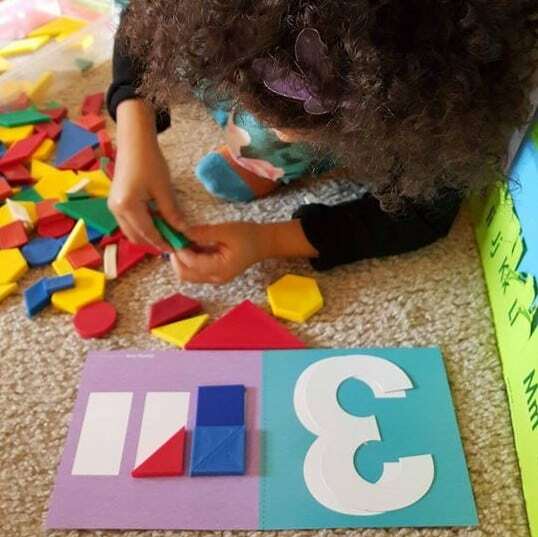 Identifying Shapes: Toddlers and preschoolers can recognize simple geometric shapes. 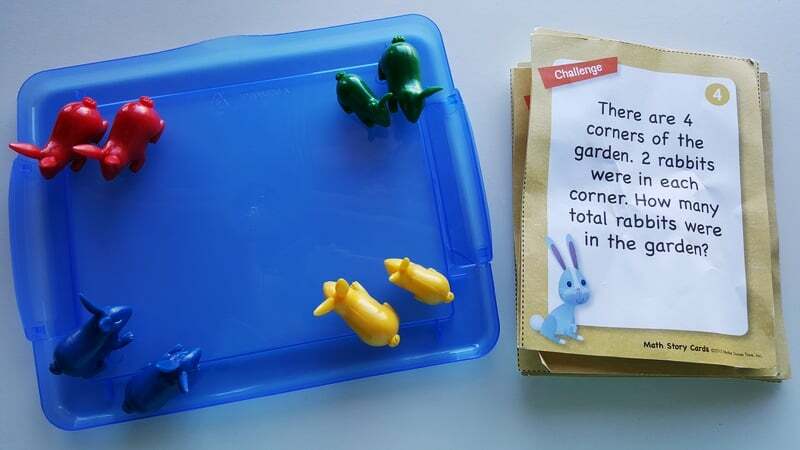 This activity matches shapes and develops visual discrimination. 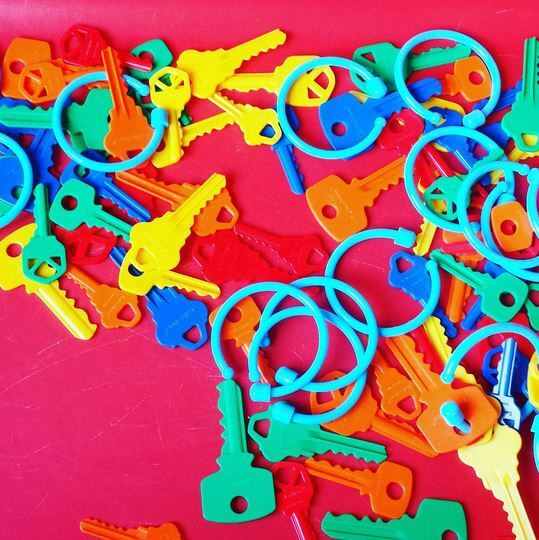 This also doubles as a fine motor activity whether the child uses fingers or the tweezers. 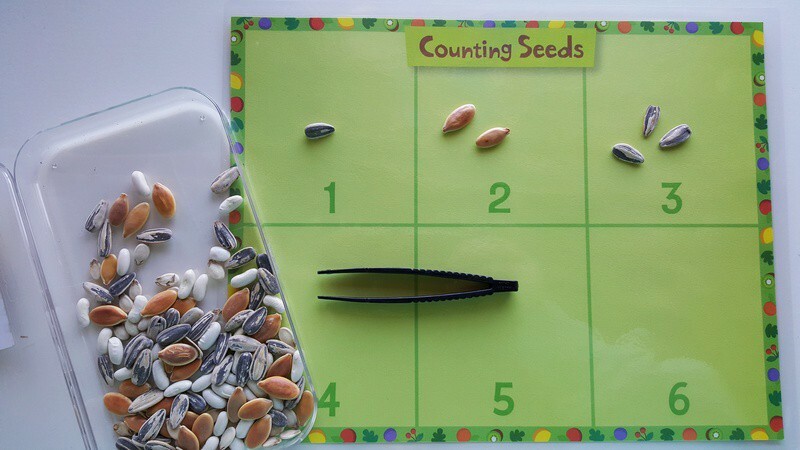 Uses seeds for counting incorporating science as well and relates to our In the Orchard theme. Spatial Relationships: Puzzles develop the concept of "part-to-whole" relationships. 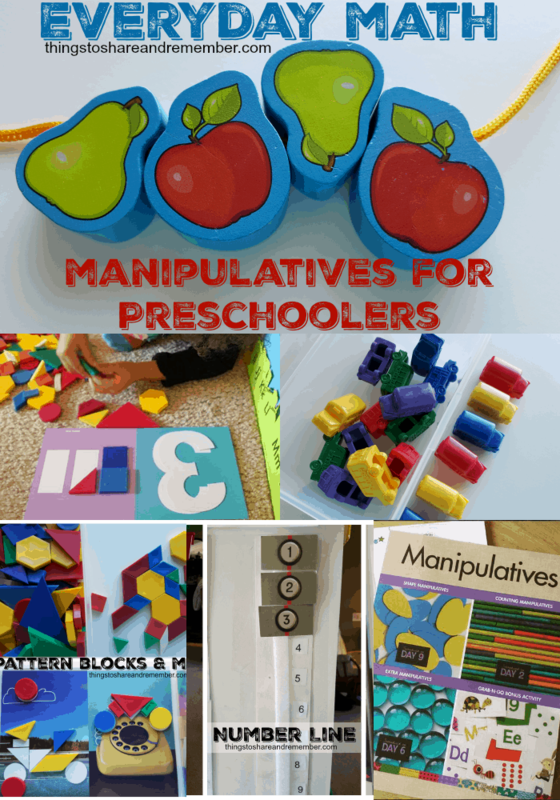 Toddlers and preschoolers begin to understand the relationship between shapes or objects. Introducing and using positional words such is "under" "front" explains spatial relationships. Problem solving is the ability to think through a problem and to recognize there is more than one path to the answer. Below, a 4 year old uses pattern blocks, Hands On Numbers, and a math mat from Mother Goose Time to create 3 rectangles. 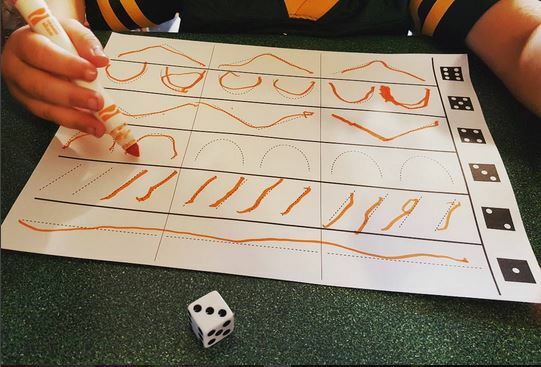 Games, fine motor development and numbers can all go together. These fruit lacing beads were included in this month's kit, relating to In the Orchard. They are a quality toy-wood beads and a lacing string with a "needle" to guide lacing. Little pie tins were also included for sorting. My group likes to make "fruit pies" so they are sorting all on their own. 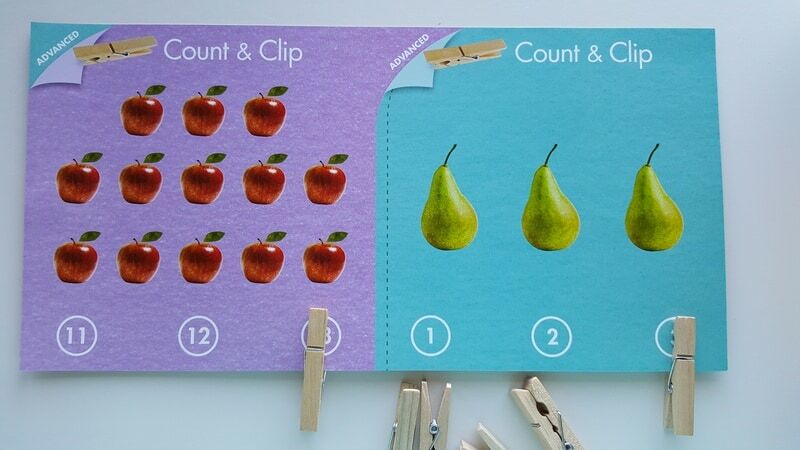 Count & Clip Cards are used for preschoolers who are developing one to one correspondence and identifying numbers. Our circle time display also features a number tree where numbers are introduced and talked about in the group setting. Children can interact with the materials throughout the day too. The Hands On numbers allow the children to match numbers, hold them, trace them and play with them. Mother Goose Time story books incorporate numbers as well. 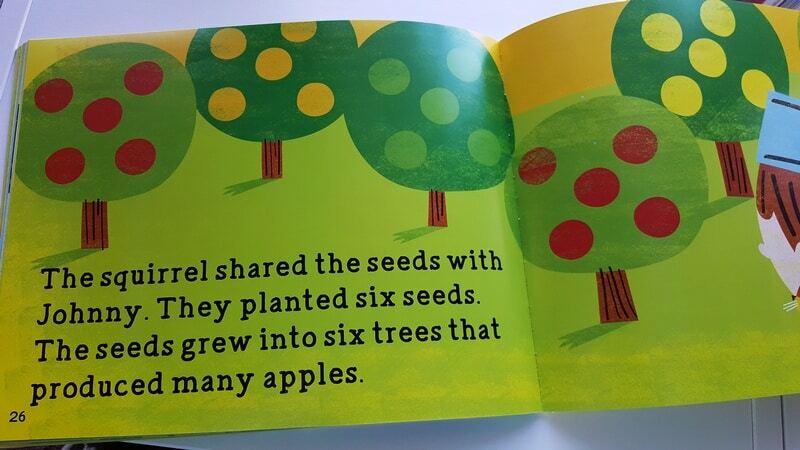 We counted the number of trees and apples in the Johnny Appleseed book. You can also see the apples are sorted by color on the trees. It's important to talk about math throughout the day, not just at a special "math time." Introduce math vocabulary. Talk about shapes, longer than/shorter than, patterns, estimate, size, measure, texture, analyze, graph. Name the shapes: circle, square, oval, rectangle, etc. Number: Start with simple numbers 0-10. Use words that show spatial relationships: under, on, above, below, in the front of, etc. 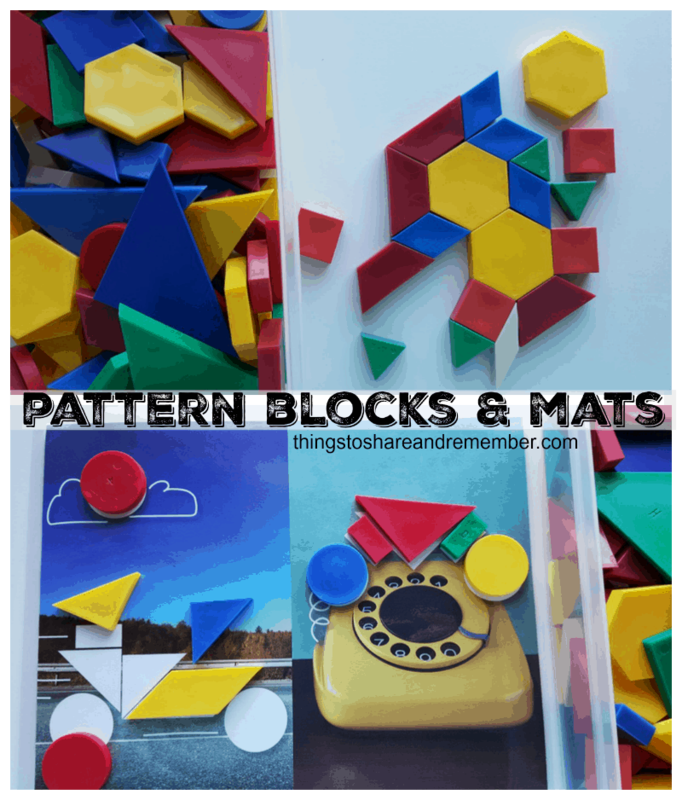 Free play is the perfect time for exploring math manipulatives. Provide a variety of materials for them to explore. The will test cause and effect relationships and form other mathematical ideas. Allow children to assert themselves and be independent. We can observe skills while the child plays. Math concepts do not need to be complex to teach. Let them learn through play!